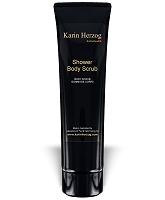 Wonderfully efficient, yet gentle, body scrub. Ground white marble and added vitamins provide one of the best most natural scrubs available, to refine and polish the skin. Ground white marble powder provides perfectly round particles to effectively exfoliate dead surface cells, but still respects the skins delicate surface. Jojoba oil, Almond oil, Apricot Kernel oil and vitamin E condition and nourish the skin, leaving it with a smooth, silk-like texture. Apply to wet skin and massage with circular movements, then shower or wash off. Ideally recommended to be used at least twice per week to keep the skin silky smooth, and hydrated. Great before applying moisturizer's such as Silhouette or Oxygen Body 1%, as less product will be necessary. Ingredients Aqua, Calcium Carbonate, Polysorbate 20, Jojoba Esters, Almond Oil PEG-6 Esters, Sodium Polyacrylate, Ethylhexyl Stearate, Trideceth-6, Apricot Kernel Oil PEG-6 Esters, Tocopheryl Acetate (Vit. E), Parfum, Methylparaben, Propylparaben.